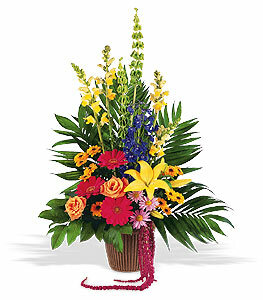 With this colorful arrangement, your deepest compassion will be felt by all loved ones. Can be used with other Colorful Compassion arrangements. One arrangement arrives with pink gerberas, yellow lilies and snapdragons, blue delphinium and orange roses in a nature inspired-container. Page loaded in 0.5331 seconds.